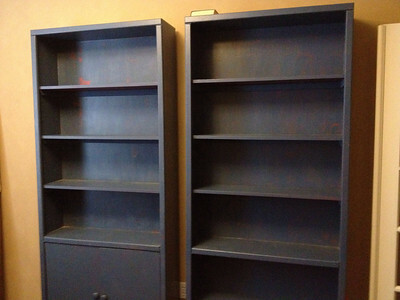 In my first two posts on home libraries (here and here), I review two of the book cataloging systems I’ve tried and recommend. There are others you can try, such as Goodreads (very Facebook-like interface; owned by Amazon). My books were organized roughly by topic, as I define it, along with a couple of shelves of my new books that I could not wedge into the right shelf. 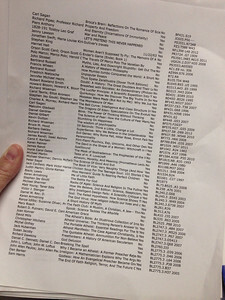 After consulting with fellow blogger here, LibraryLady, I decided to put all my books into order using the Library of Congress numbers. Since the software will sort on that category, I printed out a copy, searched a bit online for missing numbers, and then got to work. 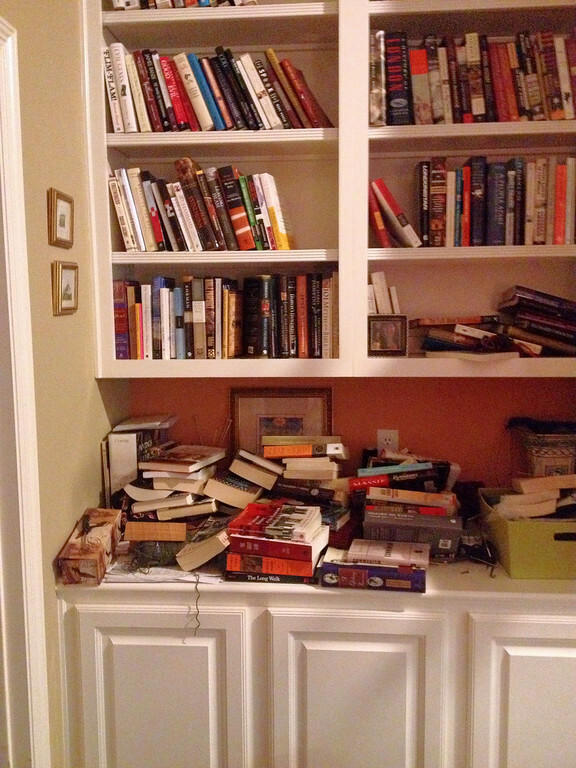 I dumped all of the books in my study, relocated the bookcases to the garage, and took advantage of the annual Elfa sale at The Container store to install ceiling-to-floor, edge-to-edge shelving, along with a smaller area with a desktop. As I reshelved the books, I marked them off of the list, which gave me an opportunity several times to go “where in the hell is my biography of Peter the Great?” I started in the living room, and then shelved the bulk of my books in the new study arrangement, leaving some areas for over-sized books or special volumes that I want to display. With the added capacity, I was also to leave space for additions. All of my fiction books were alphabetized by author, rather than strictly using the LoC System. I think I must have every book Larry Niven ever wrote. My next step will be to go back into my software and make a location category, where I can put in a code that will tell me where a particular book is shelved. After everything is cleaned up, I’ll print a list and keep on a shelf for quick reference, or for my guests to use. 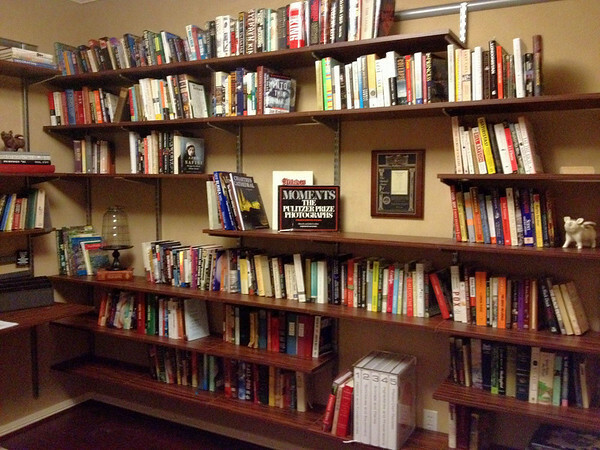 It took me about 16 hours to unload and re-shelf approximately 900 books. Books are heavy, some of the shelves required use of a step stool, and I had to move them around a few times (all this with a broken ankle, no less). However, now I have system in place. 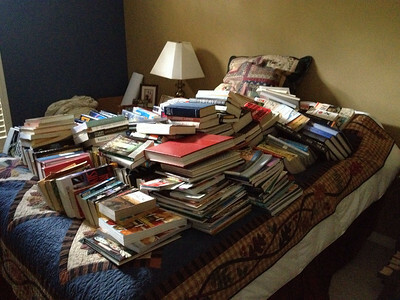 If you have more than a couple hundred books, and especially if you have them scattered in multiple rooms/piles/hallways/table tops, it might be work your time to work something out. 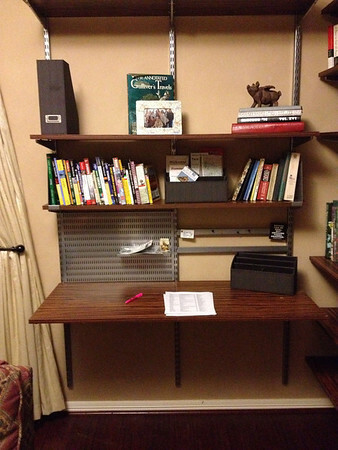 Desk area in progress: reference books, my travel books, magazine storage. Categories: book review, General Stuff! I have most of my cookbooks in the top shelf of my pantry. Ay my previous house I had them in the bottom shelves of my cabinets, but that house had a lot of cabinets.